Gifts from Home care packages provide our troops with items that help them survive a harsh and hostile climate. Thousands of America’s military continue to serve in difficult and dangerous places. They are far from the comforts of home. There are no corner drug stores in remote Afghan villages or the ISIS-controlled areas of the Middle East. They need to know the public back home cares about them. They need items to protect them from the burning sun, dust and filth. 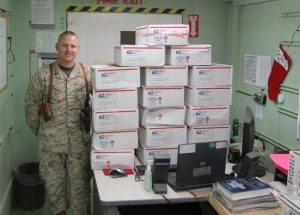 Freedom Alliance has sent more than 150,000 Gifts From Home care packages to U.S. troops deployed overseas! For security reasons, each care package must be accepted by an actual service member stationed in the area. Without the name of a real soldier, packages will not be delivered. Send your package through Freedom Alliance: we work directly with the troops in the field. We send each box to a secure overseas postal facility. It is then delivered to a Soldier, Sailor, Airman, or Marine who has requested a package from Freedom Alliance. American heroes are still deployed and still in danger. They need to know they have our support. Show our deployed warriors they have our support by making an online donation. Many organizations that used to send care packages have shut down and ceased operations. They no longer exist. Their good work has come to an end. We can’t leave our troops without the supplies they need. – Josiah, a U.S. Sailor who was on a Navy ship providing disaster relief after a major earthquake in the Far East. Each care package costs $35 to send to a fellow American in harm’s way. • $280 will send eight (8) care packages.